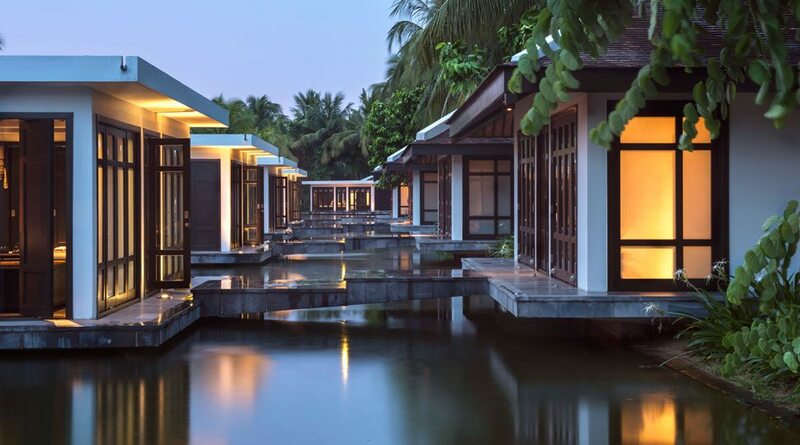 Walking through Hoi An, home to the new Four Seasons Resort The Nam Hai, Hoi An, Vietnam, gorgeous beaches and three UNESCO sites, may feel like stepping back in time – but it also speaks to the future of Vietnam. It was once the seat chosen by kings, emperors and merchant empires. Today, Vietnam’s central coast – home to exceptional beaches and gateway to three UNESCO sites – is in the midst of an inspired revival. I love wandering Hoi An’s ancient cobbled streets, particularly during the full moon, when strings of lanterns bring the façades of ochre-walled 18th- and 19th-century European, Vietnamese, Chinese and Japanese shophouses alive with light and colour. Established in the 15th century, this tiny town on Vietnam’s central coast was a busy port until the mouth of the Thu Bon River silted up in the 19th century and all trade moved to Da Nang, 30 kilometres (18 miles) north. I’m not alone in my love for this town and the central coast. In making Vietnam my home over the past decade, I’ve seen a flurry of energy and investment in this geographic and cultural heartland of the country. As a result, walking the pedestrianized streets in Hoi An, now a UNESCO World Heritage Site, feels like stepping back in time. Fishing boats bobbing on the canals blur the reflections of tradespeople hurrying home from their woodcarving, tailoring and painting shops for dinner. From cosy bars and restaurants set within timber-frame structures, ambient lamplight and delicious smells attract hungry patrons like moths to a flame. 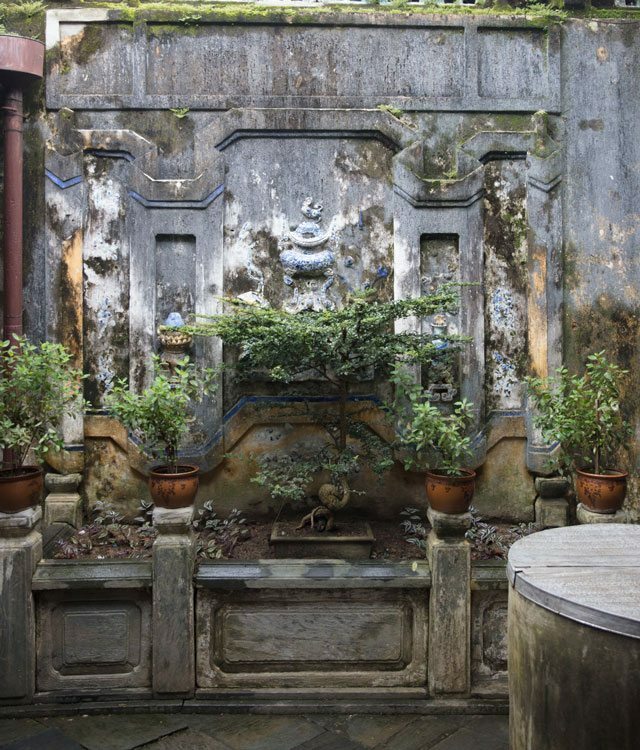 In Hoi An’s historic Tan Ky House, an altar wall stands to prevent unlucky things from coming into the home. 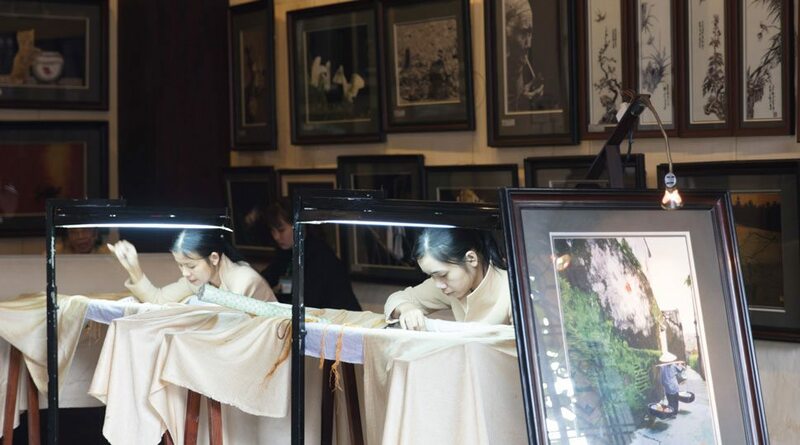 Artisans practice careful embroidery in a small handicraft workshop in Hoi An. 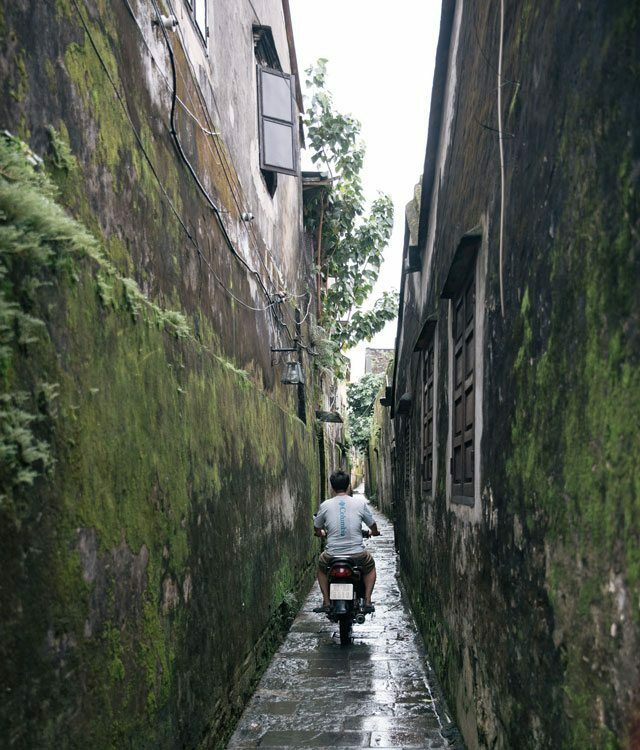 A man rides his motorbike in one of Hoi An’s alleys. 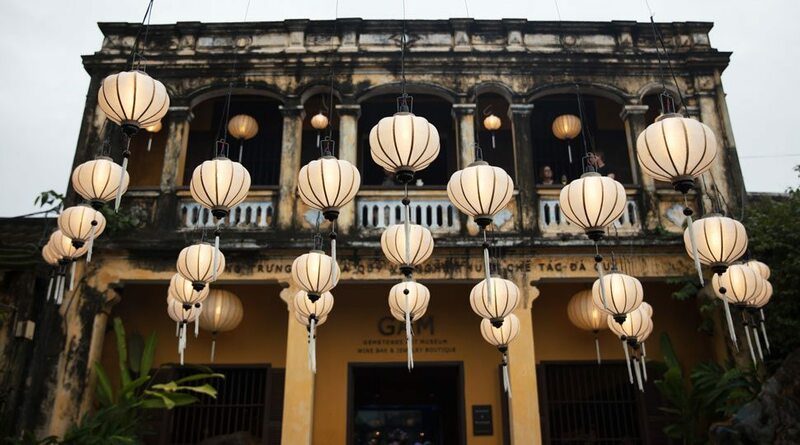 Hoi An is known for its handmade lanterns, which adorn many of the streets in Old Town. 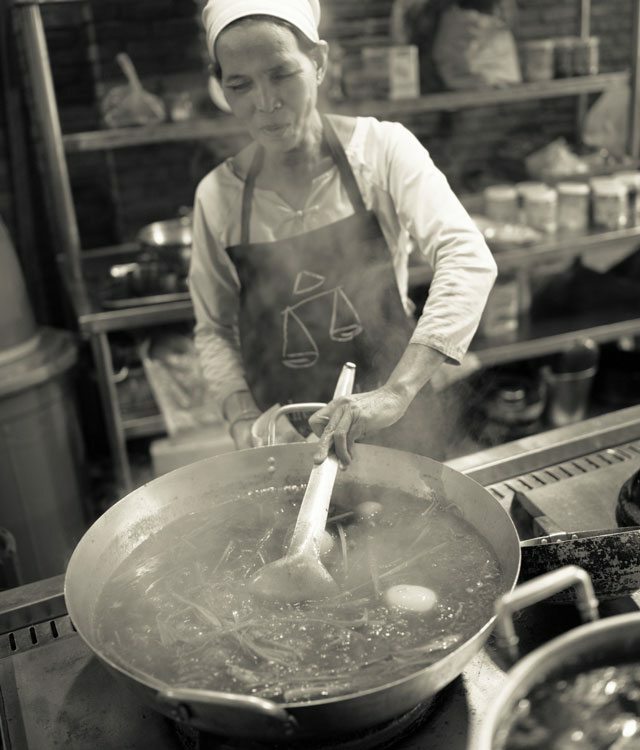 Vy’s Market serves local street food specialties, including cau lao (fat rice-flour noodles, pork and local greens). 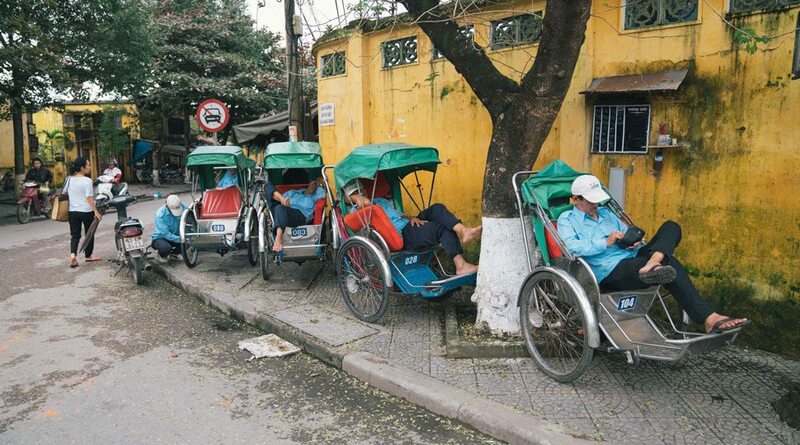 In between trips, rickshaw drivers take a rest in Hoi An. 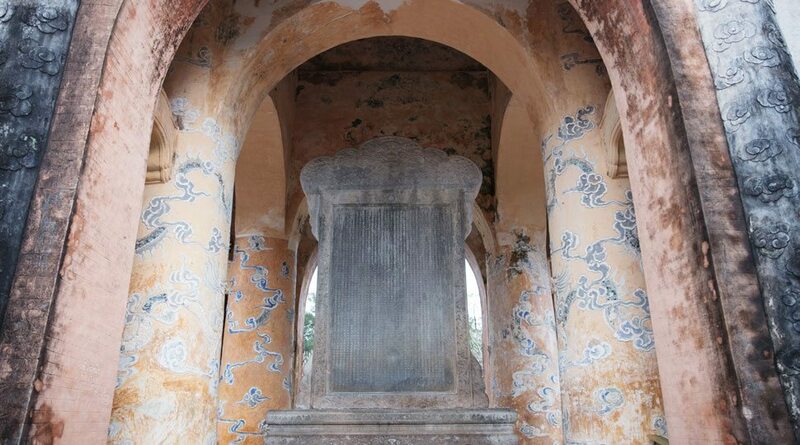 Centuries of Hoi An’s history peek out amid more recent growth. 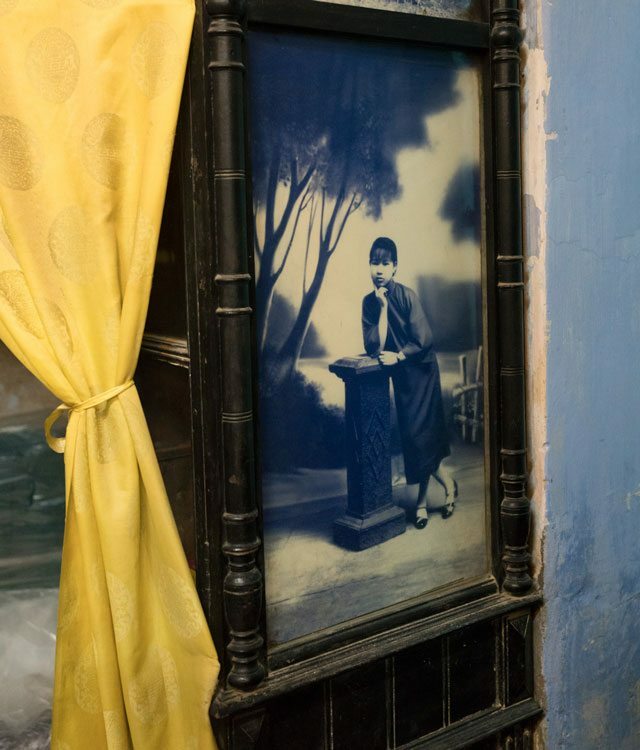 Reminders of the past meet Hoi An visitors at every turn. Q Bar, set within a 19th-century house, is an ideal spot to lounge on silk cushions over a lychee martini. The setting embodies the many influences drawn to the central coast over the years: In the rear, the décor and garden are inspired by Japanese aesthetics. The interiors upstairs feel redolent of 1920s or ‘30s Shanghai. 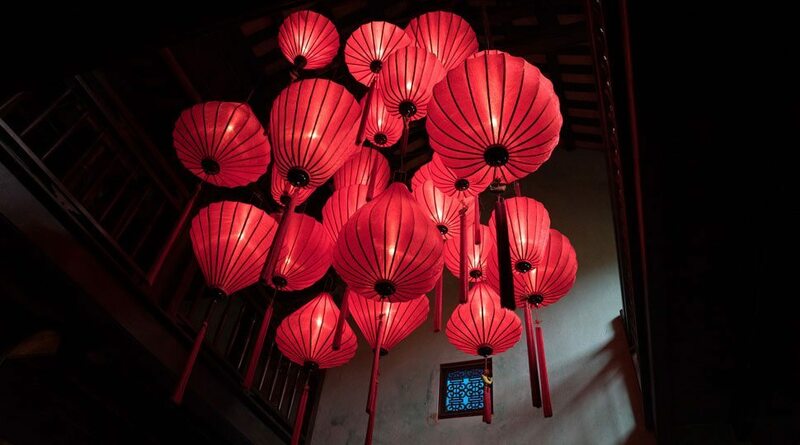 And the Vietnamese fretwork, backlit in boudoir hues of red, was created by craftsmen using local wood. I always alight first at Vy’s Market – from the same proprietor as the excellent Mermaid and Cargo Club restaurants – and watch the cooks work elbow to elbow, preparing local street food specialties such as banh bao vac, or “white rose” dumplings (steamed, petal-shaped dumplings of rice flour with a filling of spiced pork or shrimp). For more contemporary fare, I’ll swing by Chef Tran Duc’s Asian fusion eatery Mango Rooms, one of Hoi An’s longest-running and best-known spots, and order spicy Super Fly Shrimp and gingery red snapper. I’ll also make a point of visiting the chef’s newer outlets: Mango Mango, on the opposite bank of the Thu Bon River, and traditional homestyle eatery Mai Fish. I’m not alone in my love for this town and the central coast area that surrounds it. While making Vietnam my home over the past decade, I’ve seen a flurry of energy and investment in this geographic and cultural heartland of the country. 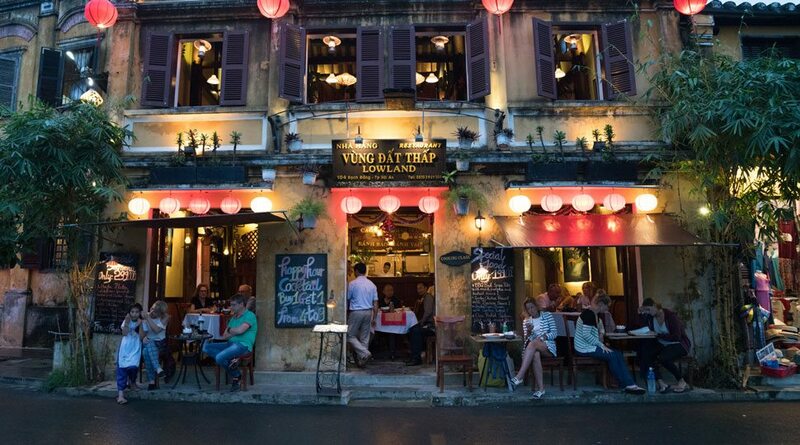 The fact that Hoi An’s modern-day entrepreneurs can open one shop or eatery after another is evidence of the overall upward trajectory of this region. Nearby Da Nang, now Vietnam’s third-largest urban area, is the poster city for the country’s growth. While its beaches are picture-postcard perfect, what gives the central coast an edge is its position as gateway to three UNESCO World Heritage Sites. The beaches that stretch from Da Nang to Hoi An are among the world’s most beautiful. Some are justifiably quite popular, but I can always find a quiet spot somewhere along the 900-metre (half-mile) My Khe beach. When I want company, I visit one of the beachfront grill shacks or backpacker bars on lively An Bang or Cua Dai, both easily accessible from Hoi An’s downtown by bicycle or xe om (motorbike taxi). Yet it’s not throngs of visitors or new development but a wealth of natural and cultural treasures that characterizes the central coast. While these beaches are picture-postcard perfect, what gives this region an edge over other gorgeous Southeast Asian destinations is its position as a gateway to three UNESCO World Heritage Sites. 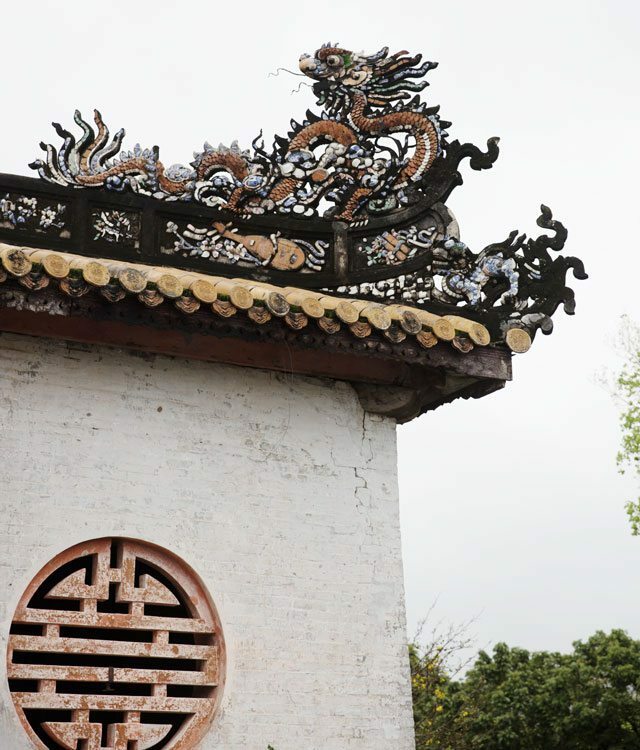 In the 19th-century feudal capital of Hue, this dramatic pavilion sits just east of Emperor Tu Duc’s tomb. 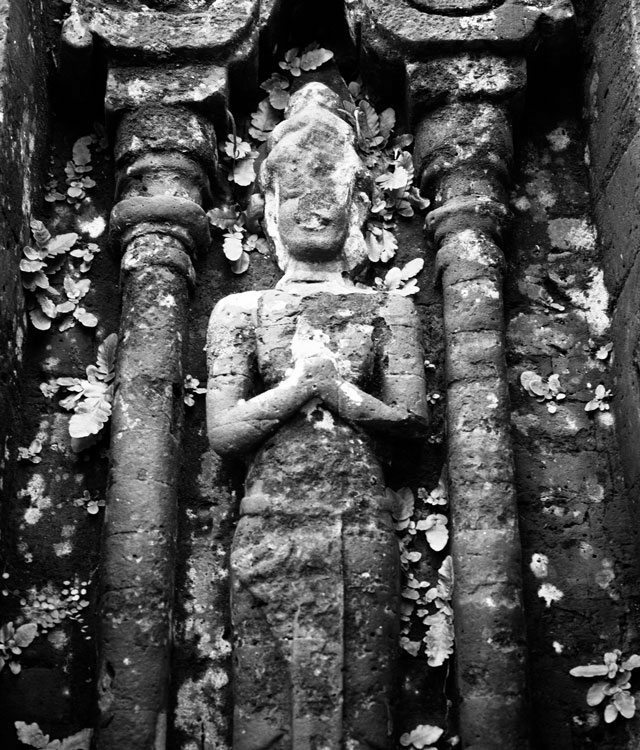 Only an hour’s drive inland lies My Son Sanctuary – a collection of moss-covered ruins, all that remains of red-brick Hindu temples constructed between the 4th and 14th centuries. 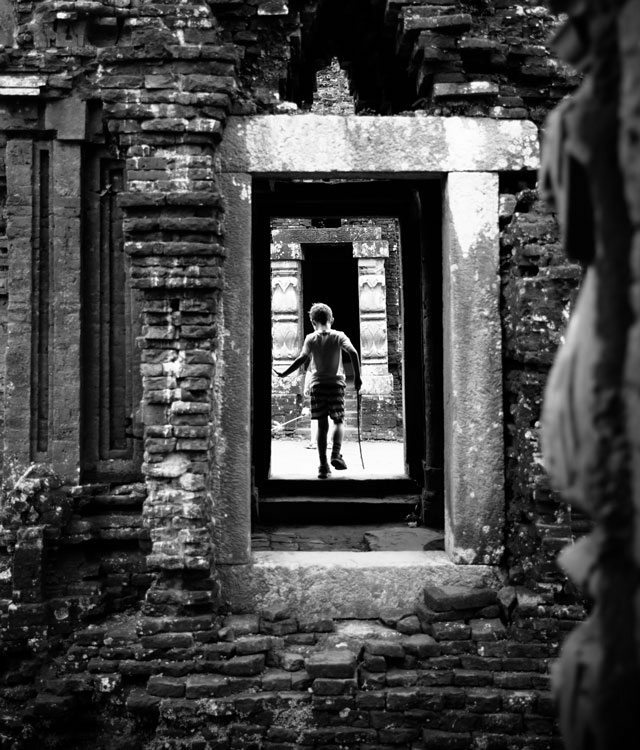 My Son Sanctuary lives on as a UNESCO World Heritage Site. 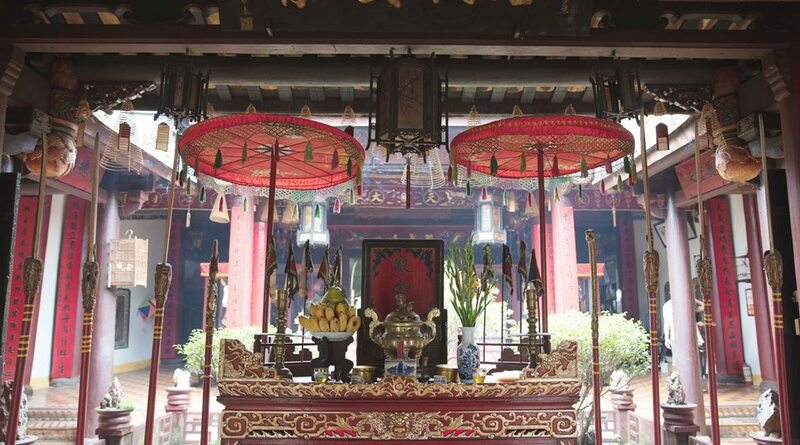 Juan Cong Pagoda, established in 1653, is popular among ethnic Chinese visitors from surrounding areas who come to pray and light incense at its many shrines. 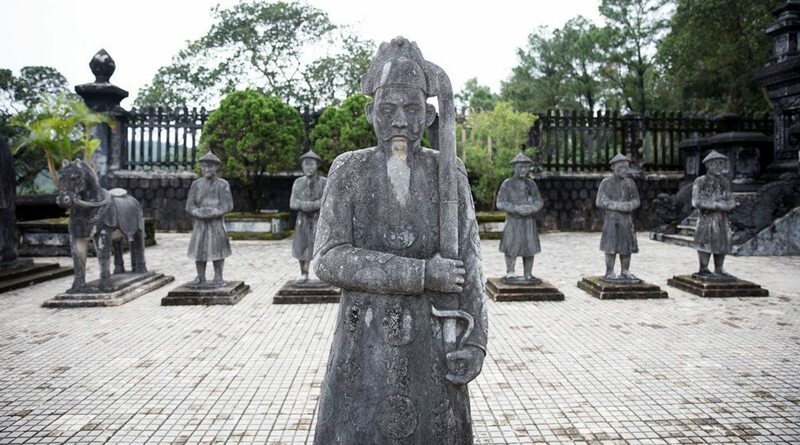 In Hue, 12 stone sentinels guard the tomb of Emperor Khai Dinh. 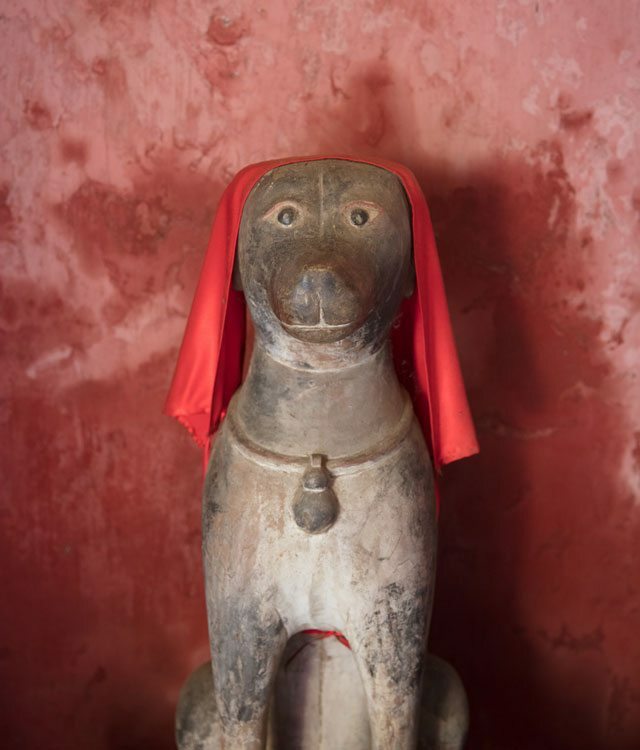 A weathered dog statue guards one side of Hoi An’s 18th-century Japanese Covered Bridge. 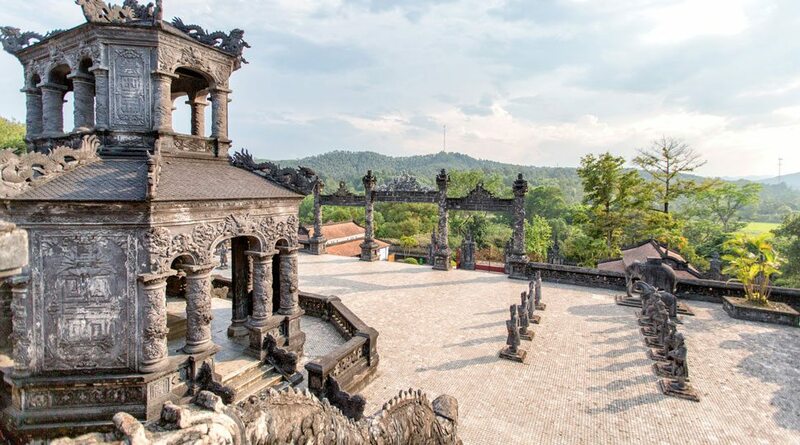 Hue, a city of distinctive landscapes and impressive architecture, has inspired songs, verse and stories since at least 1802, when Nguyen Phuc Anh, who later became Emperor Gia Long, chose the spot for Vietnam’s ruling Nguyen dynasty and its imperial citadel, now UNESCO listed. 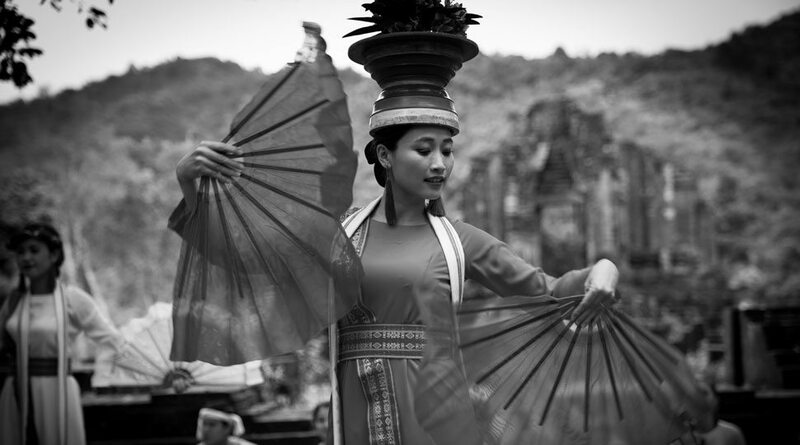 Today, those who visit the imperial city of Hue mingle with artists, incense makers, street food vendors and students who still wear the traditional Vietnamese dress, ao dai. 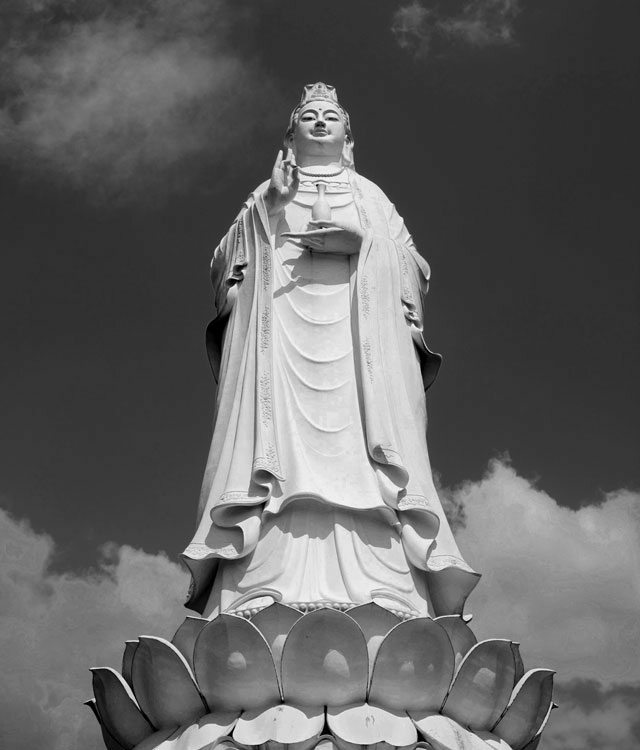 In nearby Da Nang, a statue of the Goddess of Mercy casts her gaze out upon the sea. A closer view of one of the more than 70 Hindu temples still extant at My Son Sanctuary. 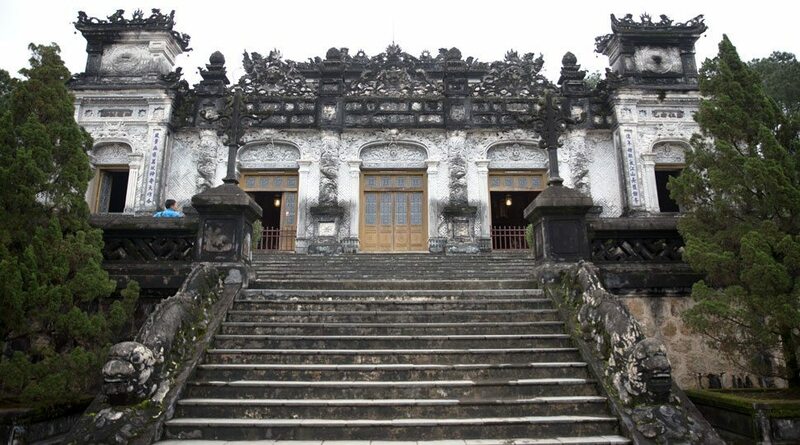 Back in Hoi An, more historical and cultural riches await in the UNESCO-listed Old Town. Its museums, historic family homes, temples and venues for traditional performances are accessible via books of entrance tickets. Marking one edge of Old Town, the iconic covered Japanese Bridge, constructed by Japanese merchants at the end of the 16th century to connect their quarter with the Chinese neighbourhood on the other side of the river, is the only known bridge attached to a Buddhist pagoda. Two-storey family home Tan Ky House incorporates Chinese and Japanese architectural styles – walls inlaid with mother-of-pearl, wooden frames carved with dragons, crossed weapons, and elaborate fruits and leaves. Once I’ve had my fill of official monuments, I’ll continue touring the town. Many traditional shophouses have been reinvigorated as intriguing galleries, chic boutiques, and stylish places to drink and dine. In Hoi An’s Old Town, unassuming tailoring shops create bespoke suits for a snip of the prices on Savile Row, with long-running spots claiming visiting celebs among their clients. If I don’t buy something tailored, I usually fall in love with a contemporary dress or top in cotton or silk at Oche boutique or O-Collective. For a mid-shopping pick-me-up, I’ll pop into one of the town’s ever-growing complement of coffee shops or cocktail spots. 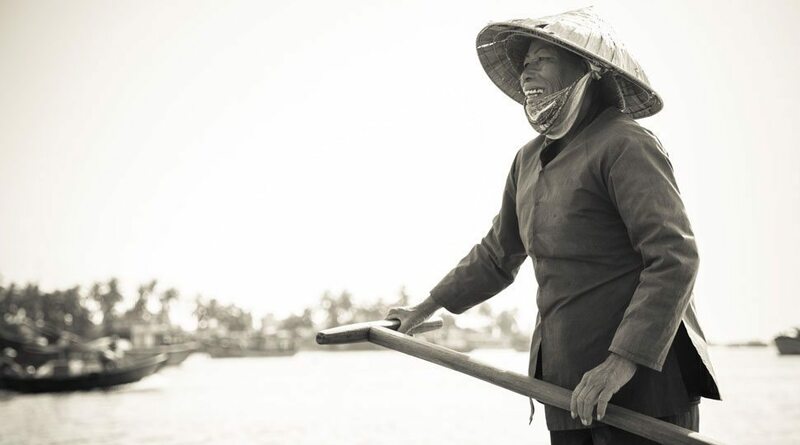 Every time I’m in Hoi An, I feel a deeper appreciation for the region’s appeal through the centuries, attracting kings, emperors, colonial administrators and prosperous merchants – and now, a new generation of globetrotters in search of the heart of Vietnam. 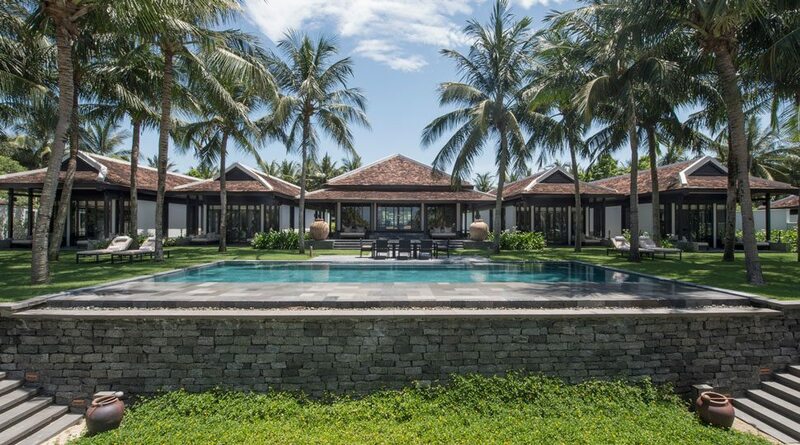 Like all accommodations at the Resort, the four-bedroom pool villa is thoughtfully positioned to maximize ocean views, beach breezes and phong thuy (Vietnamese feng shui) principles. 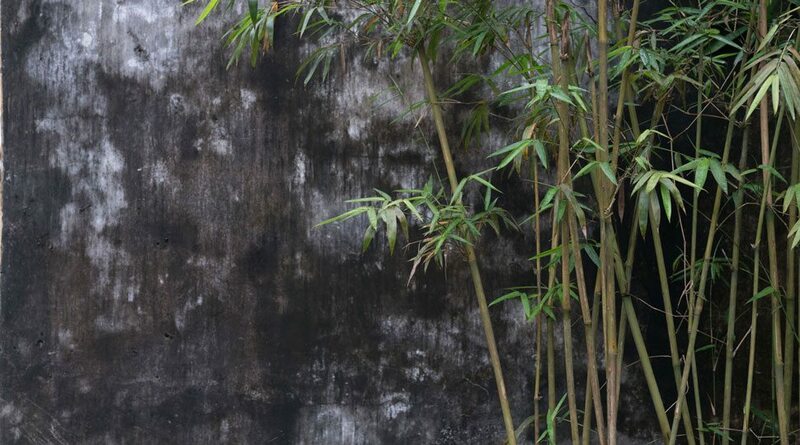 The Resort’s Heart of the Earth Spa, perched above a lotus pond, receives inspiration from renowned Vietnamese Zen master and peacemaker Thich Nhat Hanh. 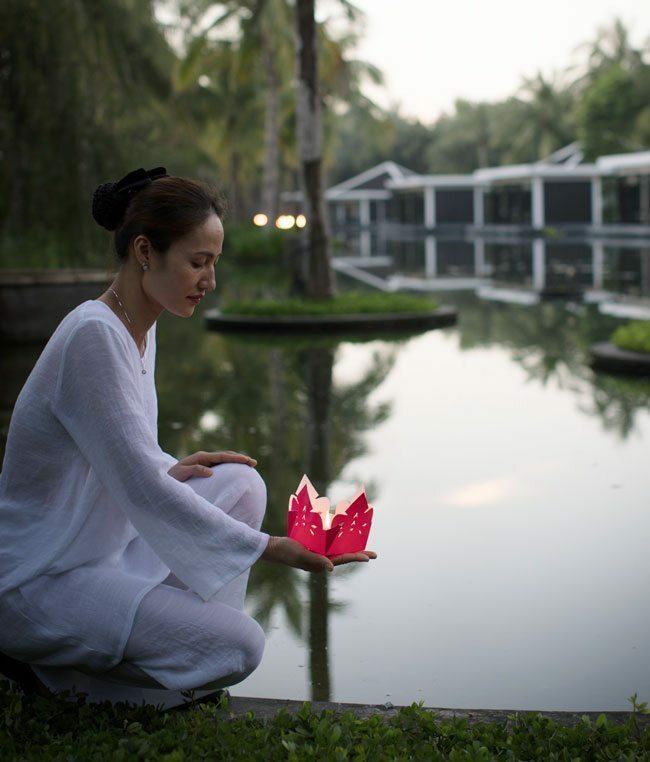 Guests can participate in a nightly ritual at the spa during which you write a personal love letter to the Earth and set it floating on the lotus pond. 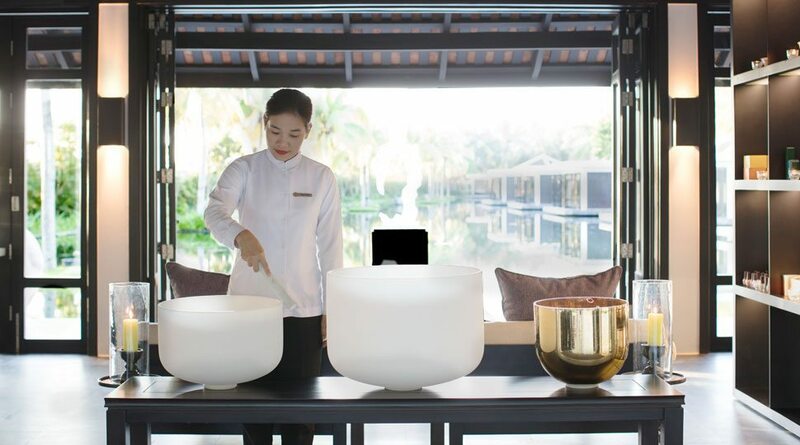 A member of the Resort staff calms a room by drawing out the echo of a singing bowl. 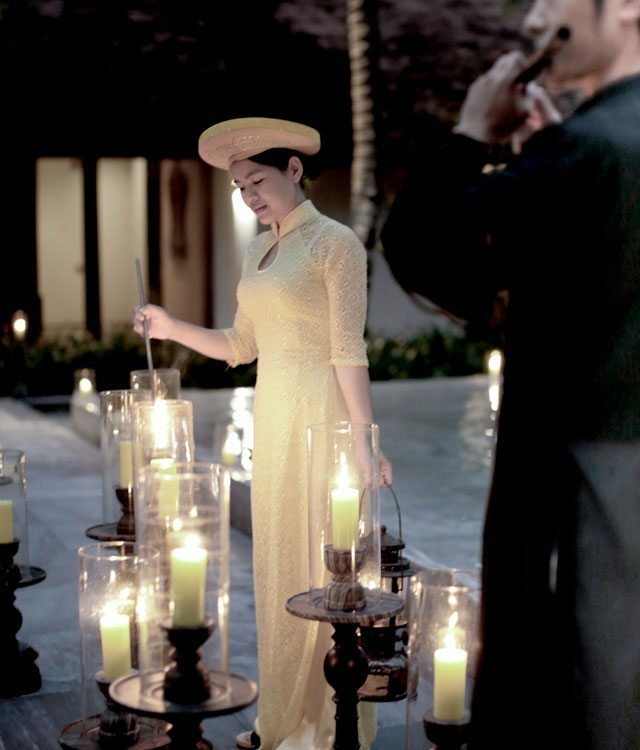 End a day of sightseeing and cultural immersion by attending the Resort’s meditative candle-lighting ceremony. 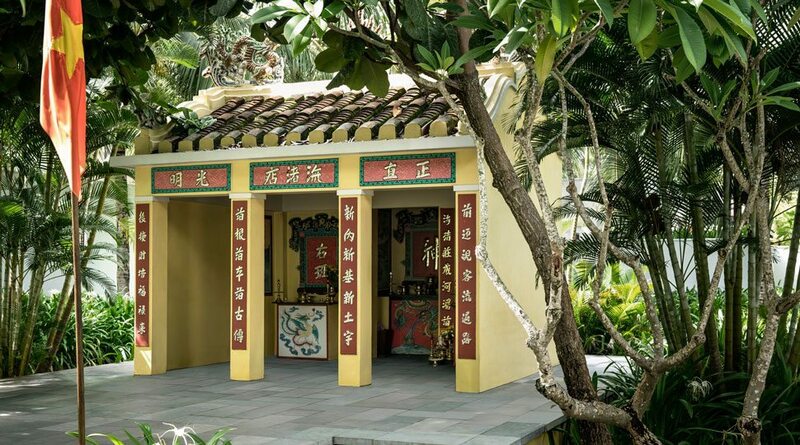 Ancient feng shui philosophy is present in the Resort’s interiors and exteriors. In a dramatic play on wind and water, all villas feature outdoor showers. Chef Tran Van Sen hosts a class at the Resort’s Nam Hai Cooking Academy. 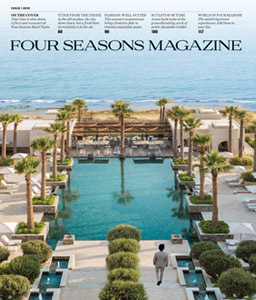 The Resort’s three pools cascade down to the beaches of the East Sea. 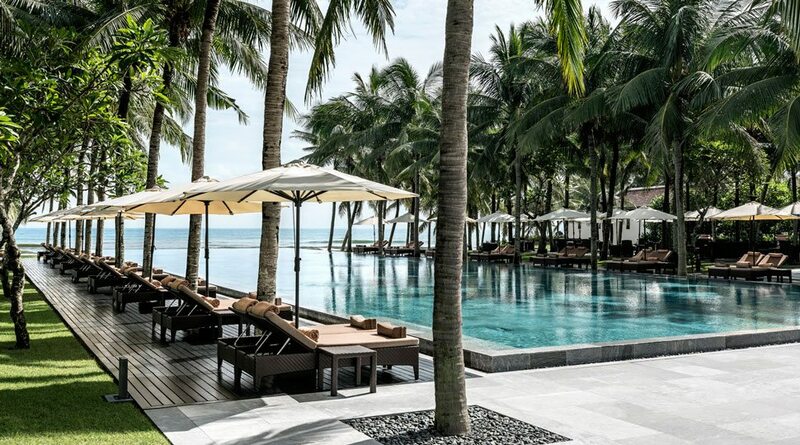 The palm-fringed Cua Dai Beach near Hoi An lures visitors to quiet stretches of sand and sun. 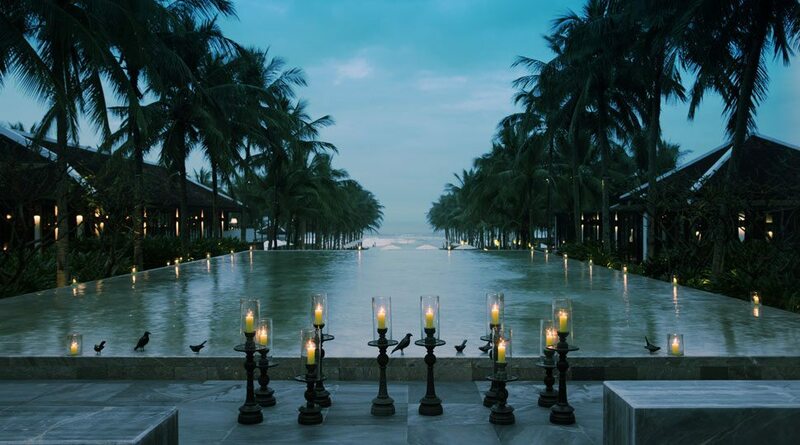 At dusk, candles light the Resort’s palm-fringed pools. 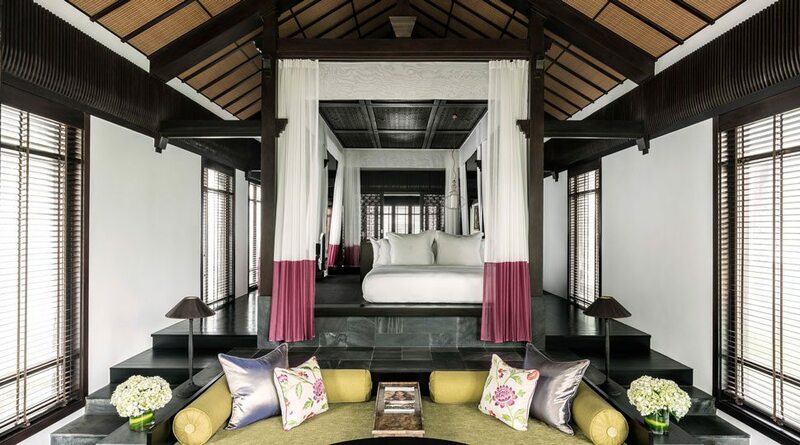 Architect Reda Amalou envisioned each room at Four Seasons Resort The Nam Hai, Hoi An, Vietnam, as an exquisite modern interpretation of the traditional Vietnamese nha ruong, or “house of panels,” bringing together classic elements of Vietnamese design with modern touches in keeping with the principles of phong thuy (Vietnamese feng shui). Open-plan, colonnaded interiors support roofs of handcrafted terracotta tiles. 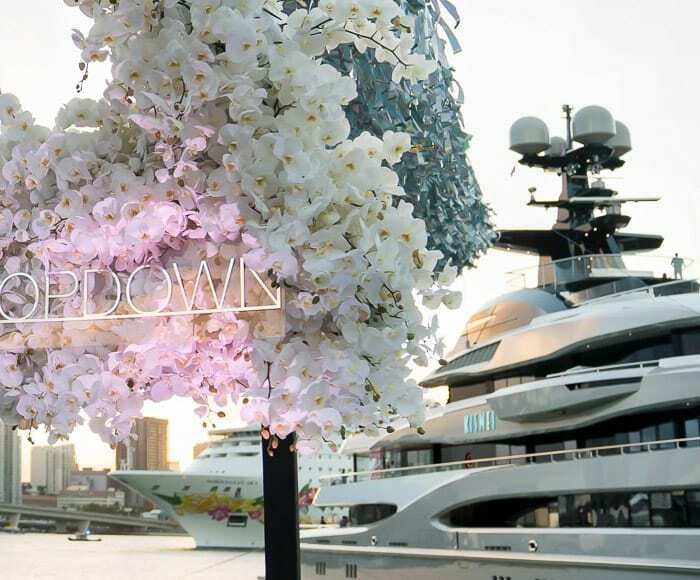 A central platform inspired by the Vietnamese phan – a multipurpose stage where the family greets visitors, eats meals and sleeps – makes room for a desk, a sunken bath, a flat-screen TV and a soft king-size bed. The horseshoe arrangement of villas gives every guest an ocean view. Equally stunning is the sight of three central pools at different levels, framed by swaying palms with the open ocean beyond. 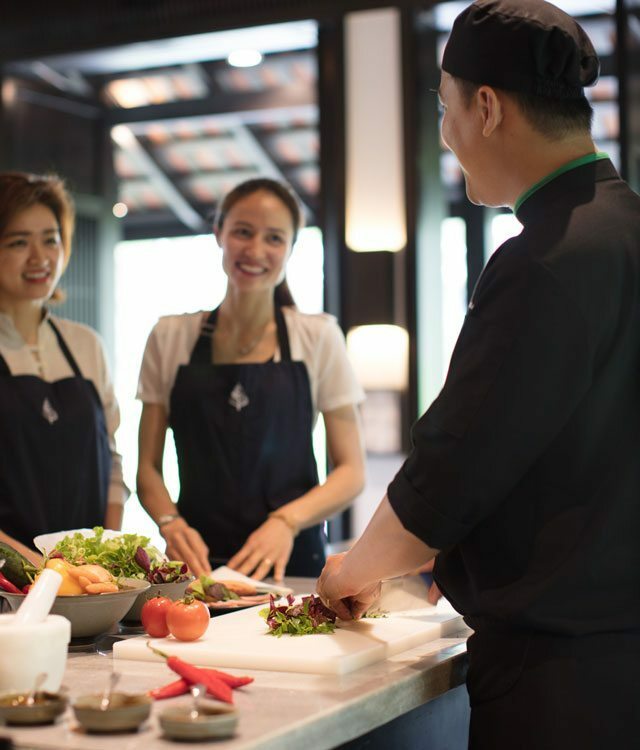 Gain new understanding of the subtleties and nuances of Vietnamese cuisine at the on-site Nam Hai Cooking Academy, led by Chef Tran Van Sen. The Academy offers single-day and week-long courses, and leads guests on a different culinary adventure each day, from visiting local markets to preparing imperial specialties such as Hue lemongrass skewers and stuffed banh khoai pancakes. Between beach visits and cooking classes, recharge at The Heart of the Earth Spa, with treatments informed by Buddhist monk Thich Nhat Hanh’s Zen teachings. 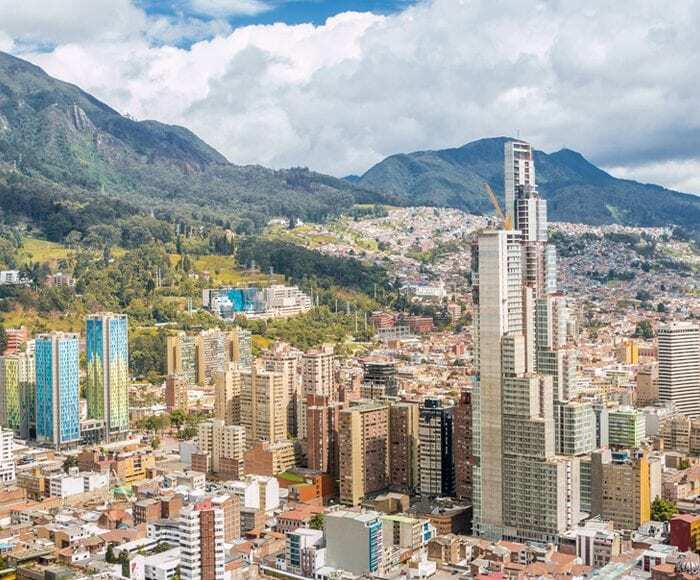 How to spend five perfect days in the Colombian capital, with a toddler in tow. 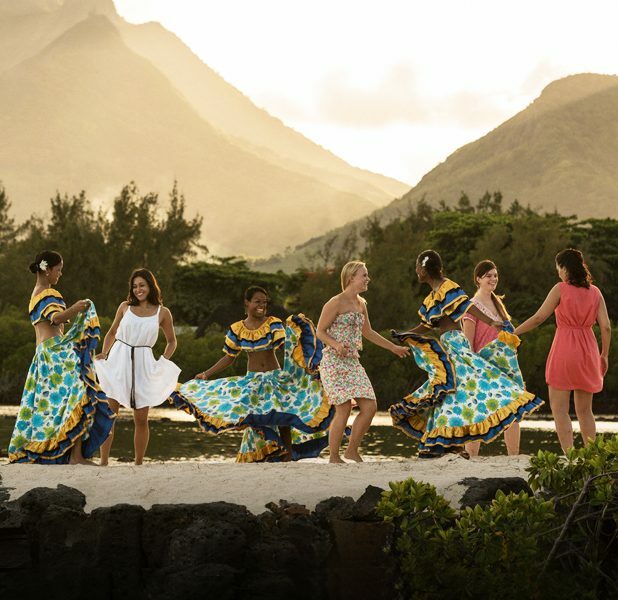 From dancing in Mauritius to sleeping in your own private resort in Chiang Mai, these getaways are best taken with a group of your favourite people.